Woohoo, I am on vacation! Finally, after a long season, we packed up our bags and headed over to the in-laws place. This time around, we decided that dad needed to experience some true Canadian culture, so we ended up camping a few nights, one in Jasper, where we managed to get eaten alive by those pesky mosquitoes... but at the same time, had a fabulously relaxing time at the hot springs. My dad, who's never been recreational camping before kept flipping constantly between being amused and amazed at everything that people brought to camp with them. It rained pretty consistently, and even though it was slightly cold and miserable, it was still a brilliant experience for dad. We were also lucky enough to spot a wolf (eating something I don't want to mention) which was pretty rare and of course, elk were everywhere. 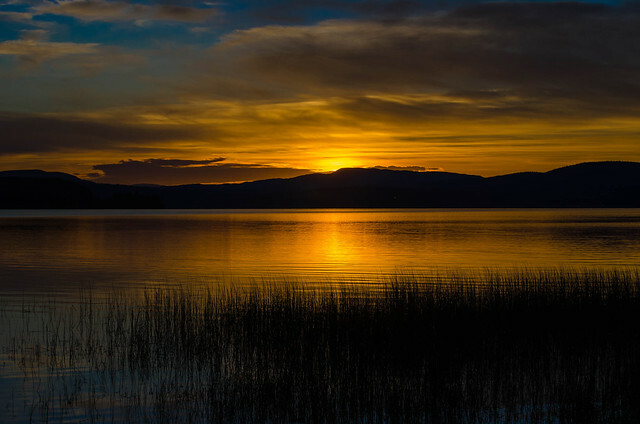 The next night at Beaumont was much better, in terms of weather, and the sunset over Fraser Lake was pretty spectacular, as you will see for yourself! We had a pretty good evening, pushing on to the in-laws the next day. So yayyyy, on vacation now, with not much to than relax and enjoy everything in this beautiful Northern BC town. But before relaxation happens, a few bits of news and a new recipe is up for sharing. 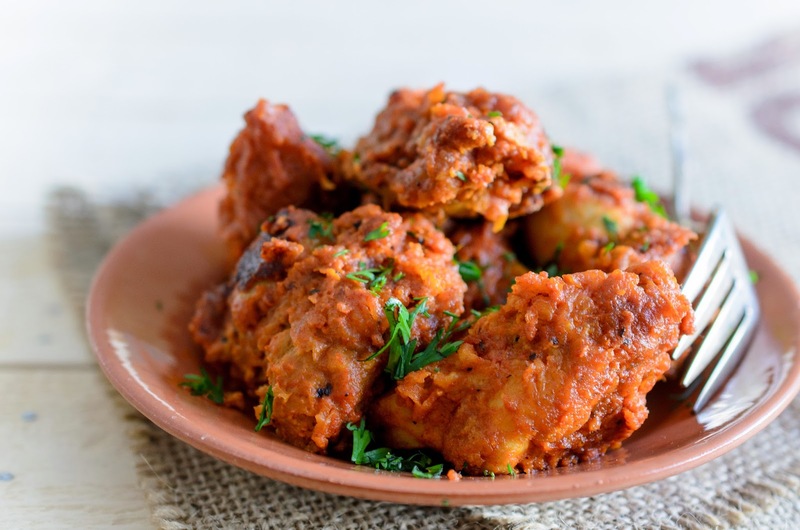 First off, I was lucky enough to win the grand prize in the BCfresh Warba-licious New Nugget Potato contest that I entered my Kerala Style Potato Avial in. I was thrilled to be chosen as the winning entry, and while all credit goes to my wonderful country of birth, I am also really lucky to be able to live in a country with lovely, fresh and local produce that makes my recipes so good. Good ingredients make good food, and its certainly a mantra I live by. So a huge thank you to all those wonderful producers out there who grow these great ingredients that make such great food. And to BCfresh Vegetables and Food Bloggers of Canada for this opportunity to show off the cuisine of my homeland. So to celebrate, I thought I should post one of my absolute favourite dishes in the world, one that instantly takes me back to the taste of my childhood and is evocative of India in a spicy, tender, crisp, hot way... an appetizer that is enjoyed in homes, dhabas, bars and posh restaurants, and in equal terms, mysterious, intriguing and exciting. 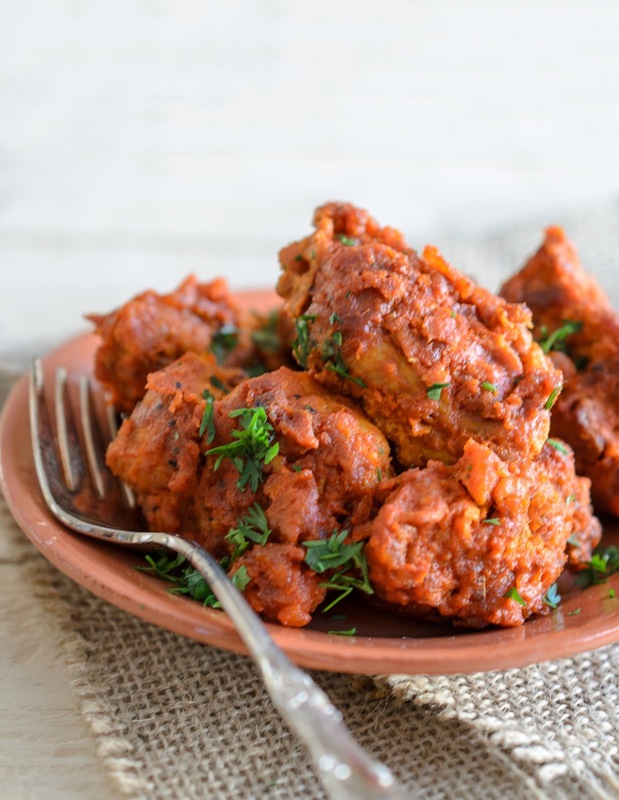 I am, of course, talking about the very classic Chicken 65, the spicy hot fried chicken in yogurt dish from the South of India. I remembered this dish on an afternoon out with my friend Diane at the Taste of Edmonton. This Indian restaurant in Edmonton (which is rather good, if a little on the fusion side) was doing their famous Butter Chicken Samosas and a Cauliflower 65. I tasted their Cauliflower 65, and I was just like, uh uh, this is not the real stuff. The dish was more akin to a Cauliflower Manchurian, rather than the more traditional 65 dishes, which are way spicier and have a slightly different flavour profile. So of course, at this point, Diane's egging me on, wanting to taste a real 65 dish. So on the very next evening I dig out my frozen Sunworks Farm chicken thighs that I bought in bulk for this very spur-of-the-moment cooking craving reason, and get to work recreating this classic dish of my childhood. Dad and I browsed through Sanjeev Kapoor's book, but Dad didn't think that the the ingredients or method he described was a traditional 65 dish. So it was off to Skype to call mother dearest, who grumbled at being woken up for just a recipe, but nevertheless dug into her tattered, handwritten recipe notes and muttered out approximate quantities and a rough method. Thankfully, I think I am now finally experienced enough to work with my mum's recipes, so Dad and I worked out quantities, and I started to write down method and techniques. Of course, at this point you're probably wondering about the unusual name of this dish, right? I did say it was mysterious and intriguing. The interwebz came up with lots of theories, and Dad and I went through each of them... discounting some as absurd and just plain silly, but then some had credence to them. For example, my theory was that a restauranteur in Madras invented this dish in 1965, and so the 65 just stuck to the end of the dish. The theory is sort of valid, because you can also find dishes called Chicken 78, Chicken 84 etc... even though none of them are as famous as the original 65. The other theory Dad and I considered was that, perhaps, this dish was made with 65 ingredients or spices, but we both discounted it, as the flavour profile certainly wasn't that complex. Dad's favourite theory about the naming of Chicken 65 was that in the war of 1965, North Indian soldiers in Tamil Nadu, who didn't know how to speak the local Tamil language, liked the chicken dish that was Number 65 on the menu, and just started referring to it as that 'Chicken 65'. It makes sense in a weird sort of way, I guess. You can also check out my step-by-step version of Chicken 65 on the Food 52 website. Cut the chicken thighs into bite sized pieces, 3 - 4 pieces per thigh, depending on how big the thighs are. Whisk together all the ingredients for the marinade. Season to taste, and rub the marinade into the chicken pieces. Refrigerate and marinate for at least 1 hour. Bring the chicken pieces back to room temperature. Heat the oil for deep frying, in a small, deep pot. I like to deep fry the chicken pieces at 375 F.
Place all the ingredients for the seasoned coating in a large bowl, and mix well. Place the beaten egg in another bowl. Dip each of the chicken pieces into the beaten egg, then dredge in the seasoned flour mixture. Very gently, lower the coated chicken pieces into the hot oil (4 - 5 pieces at a time), and fry for 5 - 7 minutes, until crisp and just cooked through. Remove on to absorbent kitchen paper, drain and let cool a little. Whisk together the yogurt, Kashmiri chilli powder, ground cumin and coriander, black pepper and lemon juice. Taste and season with a little salt. Heat about 3 tablespoons of unscented oil in a saute pan or a wok. When hot, add the chopped garlic, ginger and green chillies. Fry for about 30 seconds, being careful not to let the garlic burn. Add the fried chicken pieces to the pan, and toss through. Pour in the yogurt sauce, and stir fry on a high heat, until the yogurt is absorbed into the chicken and the dish is fairly dry. Taste and season with a pinch of sugar and more salt, if required. Serve hot as an appetizer, garnished with fresh cilantro and lemon or lime wedges. * Note: Kashmiri chilli powder is available at Indian groceries. I like the Eastern brand, but most brands will have a version. If substituting normal hot chilli powder, reduce down fairly significantly, because Kashmiri chilli powder is a lot milder. Taste and readjust as needed. To get the bright red colour that Kashmiri chilli powder imparts, you can add a tablespoon of sweet paprika instead. Recipe sounds wonderful, Michelle, but I cannot find the note on availability of Kashmiri chilli powder...Please help! Hi Janice, you can find Kashmiri chilly powder in Kairali's A Thousand Spices in 34 Ave. Its right beside the Little India restaurant. I like the Eastern brand, they usually have a big bag, which will last you for ages. Oh Michelle. this looks mouth-watering! I will be giving this a go. Congratulations on winning the competition! Now I'm craving both avial AND Chicken 65! Classic Indian chicken curry is famous for its sharp taste and aromatic gravy. This is not just a restaurant preparation, but fondly eaten in all Indian meat-eater households in daily meal. 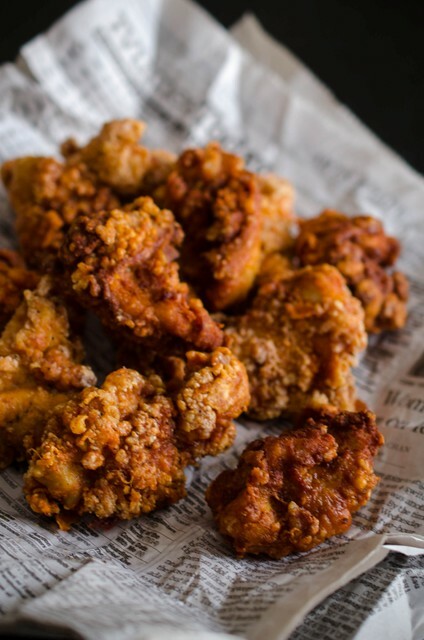 hi, i love this recipe, but was wondering, if we can bake the chicken, instead of frying it. there may be a difference in taste, but shud be healthier.. please advise..
Hi Deepali, you can bake the chicken, of course (greased tray, 400 F, 20 - 30 minutes, turning once) but I must warn you that the results won't be as crispy or moist. The deep frying adds the crisp outside and the moist inside. But do try it out and let me know how it goes, I am always curious when it comes to healthy hacks of recipes. This looks like the best recipe I've seen so far. Will certainly try it. So you don't need to use curry leaves? Thanks in advance! Thank you for this awesome recipe. I think it's the best I've seen for this dish. Just wondering, there's no need to use curry leaves then? Thanks in advance. awesome recipe, very tasty and well worth making the yoghurt sauce. I shallow fried the chicken and just cooked it for longer in the sauce, it worked out great, thanks! Normally I only eat chicken from the kfc menu....my wife tried this recipe last weekend and i'm impressed. We will certainly use it more often. Thank you for this awesome recipe. Oh my goodness Michelle! 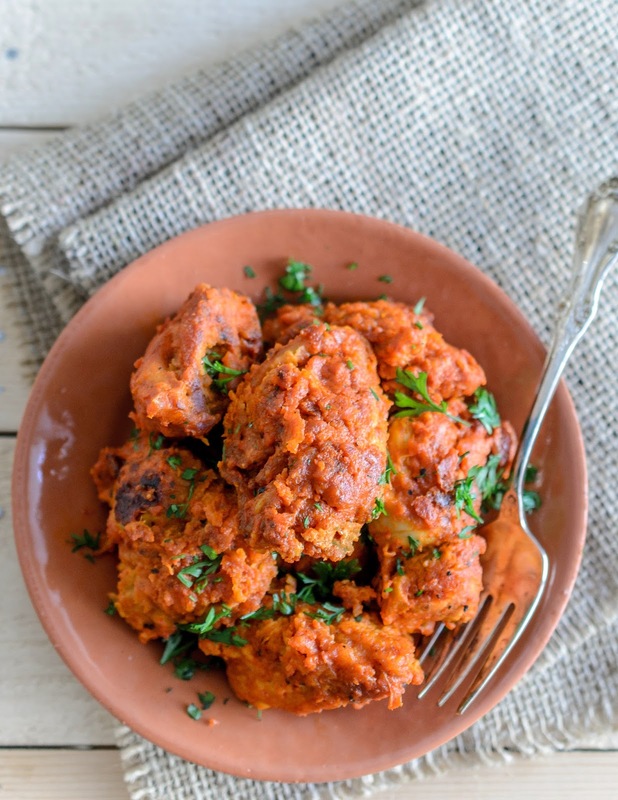 This recipe is amazing and it's truly the taste of India (Hyderabad) that I miss so much. Chicken 65 has always been a favorite of mine, but it's getting more difficult to find, even in India. My mom and I made this recipe last night and the whole family could not stop talking about how great it was. Thank you sooo much for the recipe! Hello! I love this recipe! How many people does this recipe serve? I want to make it for about 12 people. What changes should I make? I've normally eaten this as a main dinner dish at a restaurant in Austin, Texas called Sarovar. I saw that you wrote to serve this as an appetizer. Can this be served for dinner to eat with rice also?